More times than I can count, people have asked me to name some of the biggest culture shocks I experienced when I first came to the US. I can’t think of any. Sure, I once went to a public library hoping to check out some good ‘adult movies’ and came out disappointed. But, for the most part, nothing really threatened my emotional well-being. Maybe except for one thing: the way seafood is prepared this side of the globe. It was a big culture shock then. It’s still a big culture shock now. In most cases, seafood is very simply prepared in Thailand. Poaching, grilling, and steaming are the most prevalent methods of preparation when it comes to freshly-caught seafood. Anything else would only detract from its beauty. Blessed with long coastal lines of the eastern seaboard and both sides of “the axe handle,” we always have fresh seafood in abundance. Some of my fondest childhood memories involve frequent family beach vacations the highlight of which was all of us sitting around a brick barbecue, grilling various marine lives that were swimming just moments ago. I remember the firm flesh, the flavor of the ocean, the natural sweetness. Enshrouded in thick batter then deep-fried and served with tartar sauce. Chopped up, mixed with bread crumbs or other fillers, shaped into patties, then pan-fried. Boiled up and served with corn on the cob and new potatoes. Served with clarified butter as the dipping sauce. We’re not talking about good vs. bad or better vs. worse here; we’re talking about two different ways. I guess I’m set in my way when it comes to seafood. The corn, potatoes, and coleslaw — I can do without. The bread crumbs — I don’t hate, but I don’t “get” either. What I need, though, is this spicy, tangy dipping sauce I grew up with. It’s the first article in my seafood creeds. How to make Thai spicy seafood dipping sauce my way (notice the number 3): In a blender, liquefy 3 large cloves of garlic (peeled), 3 red or green bird’s eye chilies (you can also use any color jalapeño or serrano; just adjust the amount and heat level accordingly), 3 tablespoons fish sauce, and 3 tablespoons water. Pour the mixture into a small saucepan, add 3 tablespoons sugar, and bring to a gentle boil over medium-low heat; simmer for 30 seconds. (Most people skip this step which is fine. I like to do this to take the edge off the raw garlic.) Remove the pot from heat. Add fresh lime juice to taste. Adjust sweetness and saltiness to taste. I like my sauce equally salty, sweet, and sour. This makes about half a cup. This sauce goes best with poached shell-on jumbo shrimp (shown here), steamed fish, steamed mussels and clams, lightly-poached squid, grilled whole fish, and other simple, unadorned, minimally-seasoned fresh seafood. I can’t wait to grill some giant fresh prawns at the beach here in Thailand and eat them with your sauce! Is this recipe similar to the green sauce served in many Bangkok seafood joints? Hi Dale – Yup. Same sauce. You can use any color peppers you like. You’re right, though. Now that I think about it, most of the time this sauce comes in green. I guess it’s because green peppers are easier to find and less expensive. Great, now you got me craving grilled prawn. You both have me craving prawns and about anything else to try with this savory sounding dip. Leela, your recipes always have me wishing I lived over a 24 hour grocery so that I could immediately made the recipe you provide Invariably it seems like I am missing a key ingredient somewhere. In this case its the fresh seafood. Ah – I see the few fish dishes I know – Pla Pad Prik Khing and Thod Mun Pla – aren’t even the norm! :O Here in the Philippines, if you’re lucky enough to get them fresh (seashore), grilling is the most common way. Farther from the sea, deep frying (whole, no breading or additives but salt), grilling, boiling (in soup) is common. Poaching is too subtle for us 🙂 Especially for my favorite deep-fried fish, this sauce looks perfect and def. more flavorful than the bottled stuff. Manggy – Gosh, you’re right. I have to rewrite that sentence! I guess it’s the same in Thailand. When you have access to just-caught seafood, it seems like a waste to cook it via complicated methods. Farther from the sea, or when the seafood isn’t “ocean fresh” any longer, then deep-frying, etc., makes sense. I never understood the breading either. Growing up in Southern China, we make a scallion/soy sauce/hot oil dipping sauce and use it for boiled shrimp. That is the best way to enjoy fresh seafood. Will have to try this recipe, but will cut the chili down to one or not use the seeds, since we can’t take the heat. Perfectly fresh seafood served as simply as possible is a lovely thing. (although I admit to not minding the breading one bit every once in a while) Your sauce looks fantastic too! This I need to try. 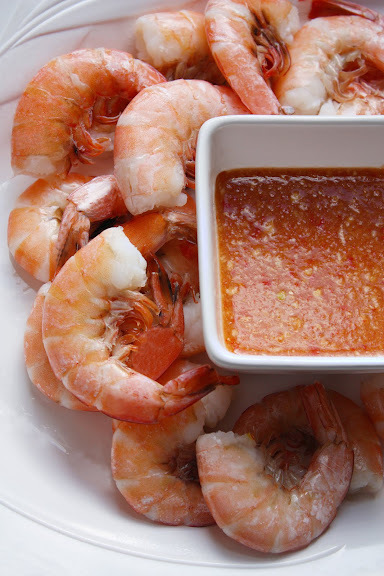 We’re grilling a lot of fish and shrimp right now and this sauce would be just perfect! I agree. I braced myself for a disappointment when we stopped at Captian-Such-and-Such restaurants to find exactly what you described. My 3 1/2 years old daughter and I bought live crabs from the market today. She wanted to study them, I wanted to eat them. Will make the sauce. Found your site not long ago. I am a big fan. I used to batter and deep-fry my fish so I could kill that fishy taste. I didn’t know that that was an indicator of lack of freshness, nor that it could be removed by soaking the fish in water with a few drops of lemon for a few minutes. I still like it that way, however, and use a great batter recipe by Jean-Georges Vongerichten, given in his book ‘Asian Flavors of Jean-Georges’. He uses rice four, wine vinegar, oils and other ingredients I can’t remember, but it gives the fish a great crispy exterior, while leaving the fish itself beautifully moist and piping hot. (He used skate, but I tend to use cod or whiting). For batter-fried fish, I wouldn’t use this spicy dipping sauce, Ian. The syrupy sweet chilli sauce would be better, no?